Contoured frequency response for clean, instrumental reproduction and rich vocal pickup. Professional-quality reproduction for drum, percussion, and instrument amplifier miking. Uniform cardioid pickup pattern isolates the main sound source while reducing background noise. Extremely durable under the heaviest use. 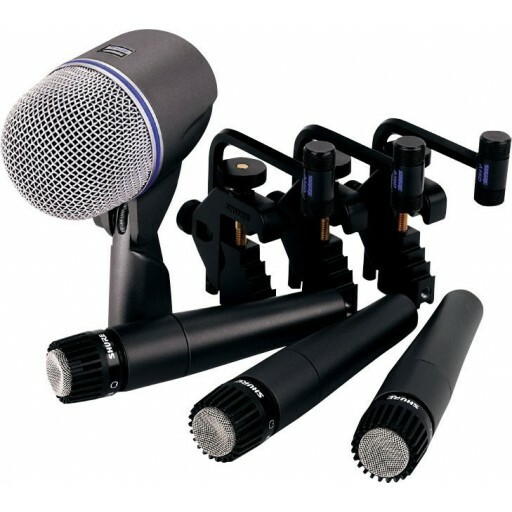 Built-in dynamic locking stand adapter with integral XLR connector simplifies setup, especially inside a kick drum. Studio-quality performance, even at extremely high sound pressure levels. Supercardioid pattern for high gain before feedback and superior rejection of unwanted noise. Hardened steel mesh grille that resists wear and abuse. Advanced pneumatic shock mount system that minimizes transmission of mechanical noise and vibration. Neodymium magnet for high signal-to-noise ratio output. Low sensitivity to varying load impedance.